Ignoring the apparitions in Medjugorje is unforgivable for Christians, says Rome’s leading exorcist who shakes his head at those who wait until the Church has ruled. Speaking of “betrayal” Fr. Gabriele Amorth also lashes out at bishops and priests for being indifferent to the fruits of Medjugorje. By willingly failing to pay attention to the Virgin Mary’s apparitions in Medjugorje, a great number of Christians have proven to be no different from pagans. Within this great number, both bishops and priests are included, the leading Catholic exorcist of the past 20 years said in a September 15 interview given to Radio Maria. “How bitter, how bitter was the last message of Our Lady of Medjugorje, on August 25: ”Many have responded, but there is an enormous number of those who do not want to hear or accept my call’, Fr. Gabriele Amorth first commented. “Now look here; it is very sour, this balance. After more than thirty years! More than thirty years! Now if it is the pagans who don’t listen to Our Lady’s words, then that I can understand. But be you a Christian, it is not forgivable. Be you a Christian!”. “The Gospel is so clear, it tells us how to discern! By the fruits you will know the tree! It has been 30 years when Medjugorje has given us fruits that are ultimately exquisite! Confession, conversion, vocations, graces of every kind! For more than 30 years!” the exorcist reminded on Radio Maria. “In the Old Testament God sent prophets to warn of the betrayals of the Jewish people. Now, here, to warn of the betrayal of the Christian people, also the priests, God sends us His Mother! It has been 30 years! Is it possible that people still do not hear? And as for those people who believe themselves to be intelligent by saying they wait until the Church approves? They are fools!” said Fr. Gabriele Amorth. Article written By Jakob Marschner. I have been to Medjugorje six times to ask for our mothers help. It may surprise you learn that I am a Southern Baptist Protestant. And while I have not been to Medjugorje myself and have no personal experience as to whether or not the Virgin is actually appearing to the two ‘visionaries’ I do not see any ‘theological’ reason to doubt it is possible. In fact, it gives me great comfort to think that it is. There is not as big a divide between us as some would think. We both, Protestant and Catholic, are united in belief in God the Father, Jesus the Son and the Holy Spirit. All the rest is nothing but chaff. I feel the same as the father, how can Rome, it’s priests,bishops, cardinals and even the Pope…not respond…not help others see more clearly what is happening. I Have had my own “personal happenings”, I often ask..why are we not responding to the the Mother of our Lord? What has happened to us? Wher is our faith? Have we been so programed by our science and modern achievements that we are failing to hear what the Lord has done and said? Prayer has to be daily in our prayers whenever we are not in contact with others. Let continue to pray, not judge and keep our hearts open to the truth that is within! One only needs to go and then judge for himself. The fruits of the Holy Spirit are very visible. Pilgrims, it is up to all of us to share the message and help all to reconcile themselves with God. Time is short and the task is great. Pray for conversion and reconversions to the faith. Wow!! Thank you Fr. Amorth for speaking out with such boldness and strength. I have been to Medjugorje and am a witness to the world of God’s love for mankind. Our Lady called me to go there for the 6th anniversary because I needed to change my life. Due to my grandmother/godmother consecrating me to the Virgin on my baptismal day, Our Lady has always protected me even when I strayed far away. Today my life has changed thanks to her. Fr. 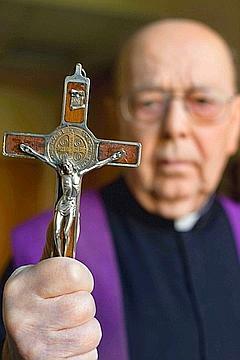 Amorth, may God bless you, a loyal son of Our Lady. Everytime I go to Medjugorie Our Lady and Her Son give me another layer of grace to sustain me through difficulties and to move me closer to God the Father. We need Medjugorie and that it becoming clearer as we see how the world is going. Just an idea concerning Medugorje. What if when the pilgrims left their houses following the pilgrimage they signed their names into a book maybe giving an indication of graces received or even just signing to acknowledge they went on pilgrimage. I believe that the signatures would be well in excess of 10’000’s per year. This cant be bad. Maybe the petition could be sent to Rome. These kind of figures cant be ignored. It is very good for a leader dealing with exhorcism to speak out so boldly about the veracity of Medjugorje and the comparative lack of understanding by Catholics taken as a whole.The daily liturgy of Medjugorje should really be emulated in every parish in the world in my opinion.Christ is waiting for us to bring our lives to him in the Sacramental life and we owe this not just to ourselves but to all our neighbours who do not have the great privileges of our own Catholic Faith.Please say a prayer that I can get the cash together to take my wife there because I am nearly dying of “thirst”! Praise be to Jesus and the Gospa.Amen. I too believe that Our Lady is sent to us by Jesus so that we repeat and become better ourselves and then help others to believe. I know that some priests do not believe in these appartions but I know what I have to do. Please those who really believe pray, pray and pray for our Shepards , especially for those who do not believe. I believe in Medjugorje and the apparitions and messages Our Lady brings to the world. I petitioned to Her back in 2007 on behalf of my father, who was at the time diagnosed with non-hodgkins lymphoma. It was well advanced, but my Dad fought harder than I have ever seen, full-heartedly returning to and accepting God in his life. He suffered much, but is healthy and well today I believe because of his deciding for God and the intercession of Our Lady. I believe our heavenly Parents wish for us to open up to them, that they would make us true and great. We have the choice to light our lamps or not, and if so, that we should raise them high for the light to be seen. In the name of The Father, and of The Son, and of Holy Spirit. It is wonderful that Our Holy Mother has stood by her children all these years. . She is a mother of Mercy and her messages ring throughout the universe for a call to pray,fasting and penance . Holy week is upon us and it is time to reconcile with ‘Jesus”. I am a poor women, living on a below poverty income . My wishes are to visit Medjugorje With the help of Holy Mother. Pray for me and my family, . Pray for the world to return to God before it’s to late. I want to share our miracle experienced.We received a rosary from medjugorje.The blessing it has brought into our home is as if mother Mary has come along with it.Praise our Father,Jesus and Holy Spirit for giving our mother of medjugorje.Truly my dear fellow Christians,we must pray for the people who don’t believe in our mother’s apparitions. Many people have been healed and many converted and returned back to God. Medjugorje is a place of peace and love, but many more have never heard of our Lady appearing in Medjugorje who shows us the way to our Lord. We pray that Vatican will approve it soon. Blessed Virgin Mary we thank you for coming to us through the vissioneries, we pray that people will return to God. Hvaljen i slavljen bio nas Bog, dragi Isus i Majka nasa u vjeke vjekova. After having been told by doctors we could not have children without medical interference, my husband and I traveled to Medjugorje in 1988 to pray for the gift of children. Today we have five living children, 18-25 years of age. In gratitude, we have tried to live Our Lady’s messages these past 25 years, sharing the messages with my students, family and friends. My proof the Blessed Mother is appearing? Chase, Matthew, Mary Margaret, Claire and Emily… Praise be Jesus and Mary, now and forever! 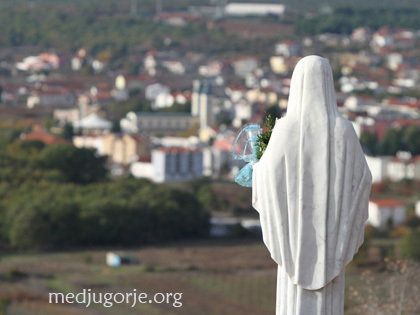 Years ago when my mother-in-law was still living she had the opportunity to go to Medjugorje. The whole family sat around the dining room table as she told us the stories and showed us the pictures she had taken while there. She was a little saddened because at the time she did not have any special mystical experiences that the others in her group declared. The rosary beads that turned to gold, the sun dancing, miracle cures – none of these amazing blessings were bestowed on her. While she spoke I was slowly becoming aware that I could see the Blessed Mother in my peripheral vision all over the walls in the pictures in her home. She had old family portraits in her dining room – kind of quirky because they were not our family but she liked the frames and the style at that time. I told her that I could see Mary in the middle of each of the families in the pictures. She was dressed in brown, with a brown mantle and a gentle smile on her lips. We moved into the living room and the same thing occurred there. It was only for that night and I was the only one who could see her but, I felt that our family was being blessed with graces from heaven due to my mother-in-laws trip to Medjugorje. Inspired by my mother-in-law and the after having that remarkable experience, I began to read anything I could get my hands on about Medjugorje and our Blessed Mother’s messages to us. This was 20 years ago – but I can still remember as clear as if it happened yesterday. My daughter Megan was 3 years old at the time and we were reading the messages of Mary from Medjugorje and I was reading to her the prayer for the day. My Megan exclaimed to me that she could see “God!” I asked her what did he look like. She said that it is not a “He mommy but a She!” and she closed the book and pointed to the picture on the front cover and told me that she saw this lady. She pointed to the corner of our living room and said that she was over there. I exclaimed to her that she was not seeing God but our Blessed Mother! I also told her that she is very special and loved by God and Mary because she was given this wonderful blessing to see Mary. One more story about Medjugorje, maybe the good Father Gabriele can relate to what I experienced since he is an exorcist. It again was approximately 20 years ago when this occurred, at the time as I noted in the previous story, I was reading the messages of Medjugorje and felt such peace and happiness that I wanted to share my joy with those I worked with. At that time I worked on a Labor and Delivery unit as an RN – night shift in a level one labor and delivery unit that had a very small number of patients. We had a lot of down time and unfortunately in these types of situations, we would fall into gossiping. For a very brief period of time though, our unit was heavenly. We were reading out loud the messages from Mary in Medjugorje and the peace and camaraderie felt then has never before and never since been repeated. After a night of Christian sharing – with Catholic and non-Catholic sisters in Christ, I went to lie down to fall asleep after seeing our five children off to school. I began to have a sense that someone else was in the room with me. An evil entity. From the corner of my eye I could see a dark cloaked figure. Although I could never see the face, I felt such an over-whelming sense of doom and could barely breathe. There was an indescribable heaviness not only in the air but also a pressure against my whole body. I was paralyzed – unable to move my arms or legs or even call out for help. The room was greyish in color and it felt as if all of the oxygen was sucked out of it. I knew that this “thing” needed to know that I was Jesus’ and it took every effort physically to make the sign of the cross – “In the name of the Father, and of the Son and of the Holy Spirit. Amen!” With the finally “AMEN” the room changed back in an instant. It was as if a giant gust of spring air blew out all of the fear and horror and replaced it with warmth, light and peace. I fell asleep instantly. I had no fear knowing that our triune God and our Blessed Mother who leads us to her Son Jesus is with me and protecting me. Ok, one more story because I believe that I should end on a positive note and that we should not live in fear but in the security of our loving Father. Fear is a lack of faith and when we are fearful we actually sadden our Lord because we are not trusting in His love and enduring kindness. During this time I also had a beautiful dream which was about our Blessed Mother. I dreamt I was at the airport. I was dragging some very heavy luggage and I was having a very hard time getting around a large beam. When I rounded the corner I looked up to see our Blessed Mother who was levitating approximately 5 feet above me and she smiled at me. When she smiled at me I felt as if I was the happiest, most serene, most at peace – the best I had ever felt here on earth. I believe it is how the soul feels when it is in heaven and the weird feeling about all of it was that I know I had felt like it before. Just not here on earth. My husband has a hard time with my stories. I have more but I need to get to rest. Pray for me my brothers and sisters. I now work as a midwife and God sends me young women almost daily that are contemplating abortion. I believe that our Blessed Mother and Jesus are abhorred by the coldness and hard heartedness of this generation and it is our duty to help guide those that have not had our opportunities and knowledge to make the right decisions. Pray for these young women and pray that I will have the knowledge, courage and strength to help fight for their unborn children’s lives. God Bless you all. I believe in Pope Francis and pray he approves this on-going miracle. How could it be wrong? Every bit of it is divine . The people, the prayers, the love and the witnesses themselves couldn’t all be lies. God hear our prayers. As we approach the End of the Age, we need even more to listen to Mother Mary and her messages of hope and exhortations to faith and obedience. May her apparitions and messages bring the world to contrition and repentance before it is too late. As a Lutheran, I find nothing threatening about her entreaties to us, but instead find them comforting, inspiring, and empowering. She makes me want to be a better Christian, and I am grateful for her voice in this fallen world. Thank You Fr Amorth, is just remarkably true. Hello Fr. Amorth. OUR LADY said in the beginning of her apearences to listen to her messages now, after the Churches approval it will be too late. Please pray for some relatives who follow the new age(occult) they stubbornly persist in this error. Thank you Fr. Amarth for your very truthful message about the validity of Medjugorje. My heart hurts for our Lady because her priests turn away and we turn away. I have been there once and want to return again. It is a very holy place. Thank you God for the gift of your Mothers. God Bless you. I have never thought of the Church’s hesitation as a way of denying Mother Mary. The fruits are great – one of my dearest friends accepted Jesus and came into the Catholic faith. How many others have had this beautiful fruit? I totally agree what Fr. Amorth, has said here, and to stand firm on everything. It is so sad that so many priests and nuns and lay people dismiss Medjugorie so much they are loosing out on so many graces that are there for them. I tell people to go there to collect a beautiful gift Our Lady has waiting for them to collect when they return they tell me I was so right. I say taste & see before you make any decession (go there).